Town with 11,000 inhabitants, the western gate of the region Hegyalja. Market-town since 1490. In 1606 István Bocskai, who was chosen to be a prince here, donated the title of the free royal town to the settlement. It is an important junction; agriculture, industries, such as sugar and chocolate production and tourism play an important role in the town. The Rákóczi Castle used to be a 13th century Benedictine monastery, it got its present Renaissance character in 1559; in 1603 it entered into the perpetual possession of the Rákóczi family. The Reformed church was built in 1321 in Gothic style. Here you can find the late Renaissance tomb of Zsigmond Rákóczi, the Transylvanian prince and that of his wife. The Roman Catholic church was built in 1764 in Baroque style, the orthodox church - in 1799 in late Baroque style. 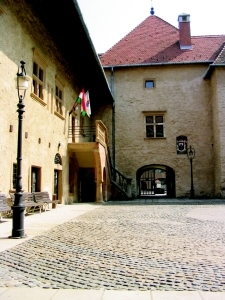 The Museum of Zemplén can be found in the Rákóczi Castle displaying a collection of 900,000 postcards. The Sugar Museum is run by the Sugarworks of Szerencs Shareholding Company.